We stock over 10,000 new tires from all major brands. We also stock hundreds of “High” trend used tires. Backed by manufacturer warranties, rest-assure that our tire service will provide the best and most cost-effective solution for all your tire needs. Always know you can trust us. Whether it’s a simple flat repair or a complicated mechanical problem, our team of factory trained mechanics can fix the problem the first time. Count on us to make safety a priority. We have state of the art alignment machines to serve you better. Call and make an appointment or just come in. We are here to make your experience a better one. In general, we will only make “wait” appointments for repairs that will take an hour or less. Any repairs that take longer than one hour we always suggest that the vehicle is left at our shop. Monday through Friday, 7:30 am to 5:30 pm. Who do I call to make a Service Appointment? 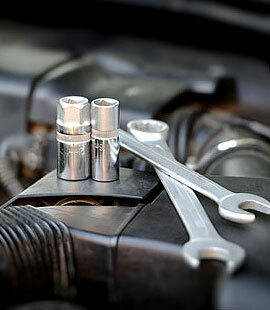 Please call the Service Receptionist at (561) 881-4547 or speak to one of our Service Advisors.